I avoid going out on Black Friday. My slender figure and frail torso makes me unable to defend the best deals from fierce opponents like small children or middle-aged women in wheelchairs. But I know a lot of people like to hit the stores early in search of the best deals, so here are some of the hottest prices I could find on HD games and consoles. There’s too much to list everything here, so I’m going to post about the stuff that looks most interesting. Amazon is being coy with their gaming deals. They are hosting week-long video game deals leading up to Black Friday. 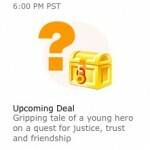 The video games deal of the day page lists mystery deals that are on a timer. When the time runs out, the deals are revealed, and shoppers can grab a limited amount of the game, console, or accessory at the deal price. Amazon is running a bunch of these deals throughout the day between now and Black Friday, so there are plenty of chances to find something of interest at a good price. Walmart’s big draw this year are those two console bundles, but they also have a selection of older games at the $25, $10, and $7 price points. Check out BlackFriday.info for more Black Friday deals. Was it even on sale?